DATRON cooperates with the leader in reliability and productivity for automatically milling dental prostheses, i.e. copings bridges, abutments and implant bars. Thanks to the use of machining processes production cycle times can be reduced significantly. In addition, the high quality finish of the machined components prevent manual post-processing. WorkNC®DENTAL's graphic interface, which is simple and easy to follow, has been especially designed for prosthetists and dental technicians who are not experts in machining technologies. 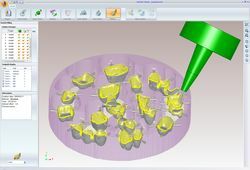 WorkNC® DENTAL comprises a comprehensive range of automated and interactive procedures that will help the user throughout the dental part machining preparation process - the choice of the machining blank, the addition of support pins and finally the launching the machining process itself. 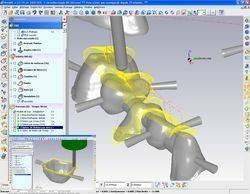 WorkNC® DENTAL harnesses Vero Software's 20 years experience and expertise in the field of toolpath generation and applies these to Dental CADCAM machining. Any CAM software should run in an open, flexible and highly automated manner. 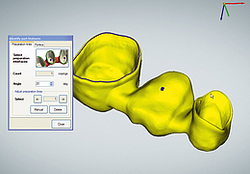 Open: To handle CAD data sets of different scanners. 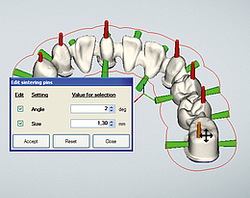 Flexible: To implement the widest variety of indications and to control several different milling machines. Highly automated: To achieve the most cost-efficient production. hyperDENT allows you to control simultaneous 3-5 axis milling machines of the same or different types, with the purchase of one licence only. Your CAM software is up to date by means of regular updates. Should you wish to purchase a new milling machine, you can transfer the already acquired CAM software to the new machine and have it installed there.